Image: Zodiac Pictures International, Ruby Films, HBO, Inna Poka/Getty Images/Design: Ashley Britton/SheKnows. It’s hard to believe that it’s been less than 100 years since American women were given the legal right to vote. It was a long, difficult journey in which many women made enormous sacrifices. To honor those who fought tirelessly, through fear and pain all for the future of America’s women, we celebrate Women’s Equality Day later this month on Aug. 26. It was on this day in 1920 that the 19th Amendment to the United States Constitution was ratified and women all over the country celebrated their right to vote after seven decades of a civil rights movement by women that first started in Seneca Falls, New York, in 1848. 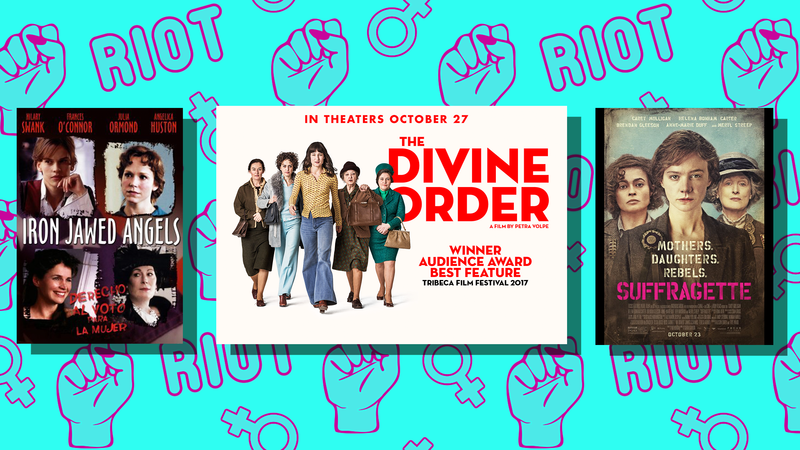 As a reminder to women everywhere to have their voice heard in the upcoming midterm elections this November, we’ve put a list together of the best movies made about women all over the world fighting for their right to vote. These are stories of resistance, empowerment and justice. This stirring film shows the painful struggle of British women as they fight to get the right to vote two years before American women. Many activists were fired from their jobs, learned jujitsu to protect themselves, were even thrown in jail and force-fed through their nose if they went on hunger strikes. The movie stars Carey Mulligan and Helena Bonham Carter with Meryl Streep as real-life civil rights leader Emmeline Pankhurst. With modern music and dazzling cinematography, this film stars Hilary Swank as Alice Paul, the real-life suffragette and women’s rights activist who was one of the main leaders in pushing for the 19th Amendment to the Constitution that would allow American women to vote. Margo Martindale, Vera Farmiga and Anjelica Huston also star. This powerful film tells the story of a Swiss housewife and mother in a time of social upheaval in 1970. Yes, as shocking as it sounds, Swiss women didn’t get the right to vote until 1971. This film is clever, funny and a great look into the shifting power dynamics between men and women that took place in the 1970s. Master documentary filmmaker Ken Burns created this film in 1999 using stunning black-and-white archival footage that shows both the excitement and the challenges civil rights activists Elizabeth Cady Stanton and Susan B. Anthony faced almost a century ago. Actors Ann Dowd, Sally Kellerman, Julie Harris and Amy Madigan provide commentary. With such great songs like “Supercalifragilisticexpialidocious” and “Chim Chim Cheree,” you may have forgotten that Mrs. Banks (Glynis Johns) was a suffragette and sang the rip-roaring song, “Sister Suffragette” with infectious enthusiasm. What a gem! Though by 1965, Black men and women had the constitutional right to vote, they were being denied access to the voting polls at every turn. This film shows the protest marches from Selma, Alabama, to the state capital of Montgomery, led by Martin Luther King Jr. (David Oyelowo). This movie is a true inspiration. Will you be voting in November? Let us know in the comments section below.